20130601 - Up in the am and L out to Zumba and J&I took G to his baseball game. It was a great game, a lot of fun, 21-6... Dropped the black car off and walked home: got stopped by 2 friends on the way to chat. Home and started working on the white car. G's buddy Owen came over to play and I had his mom run me to get the black car and borrow a tool from the guys at Tuffy so I could change the brakes on the white car. J had a couple buddies over to play too. 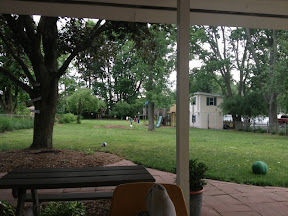 L cooked a picnic and the boys ate on the back porch and then out in the yard to play. It was a perfect day and I sat on the back porch watching the boys play, having a beer. All buddies went home and LJG&I watched Superman. Planning tomorrow, I get my D back. I am anxious to here about his 'ordeal'.